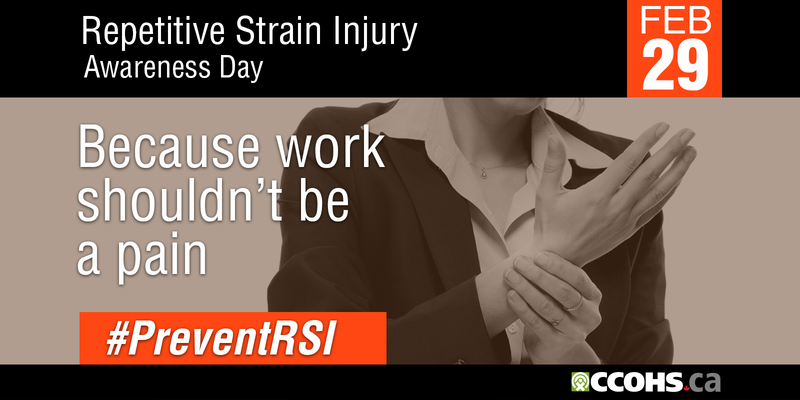 Repetitive Strain Injury (RSI) Awareness Day is February 29th*. 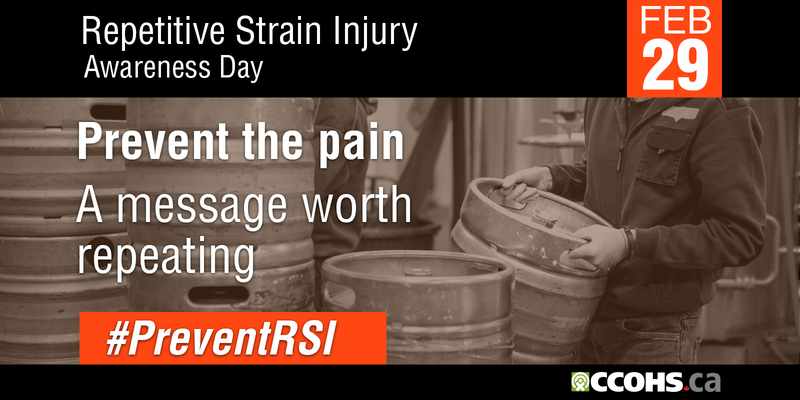 As the only "non-repetitive" day of the year, it’s the ideal date to devote to raising awareness of repetitive strain injuries. Also known as musculoskeletal disorders (MSDs), repetitive strain injuries are an umbrella term used to describe a family of painful disorders affecting tendons, muscles, nerves and joints in the neck, upper and lower back, chest, shoulders, arms and hands. 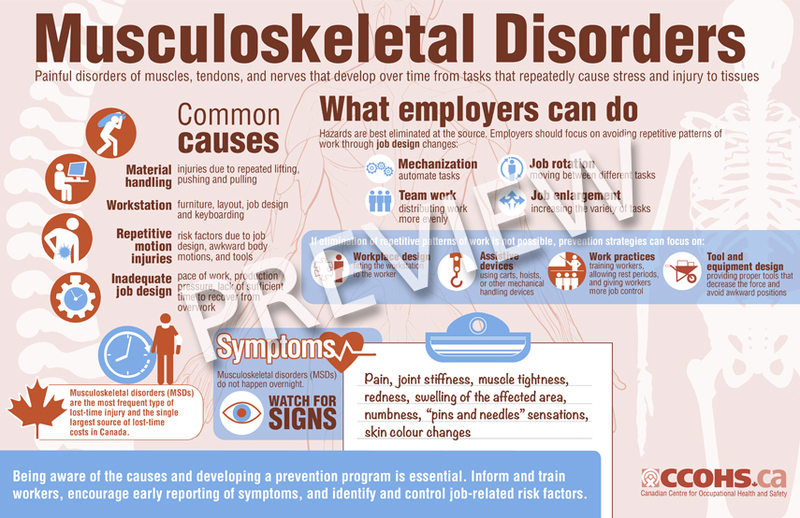 MSDs are the most frequent type of lost-time injury and the single largest source of lost-time costs in Canada. Gripping, holding, bending, twisting, clenching, and reaching - these ordinary movements that we naturally make every day are not particularly harmful in the activities of our daily lives. What does make them hazardous in work situations though, is the continual repetition of the movements. 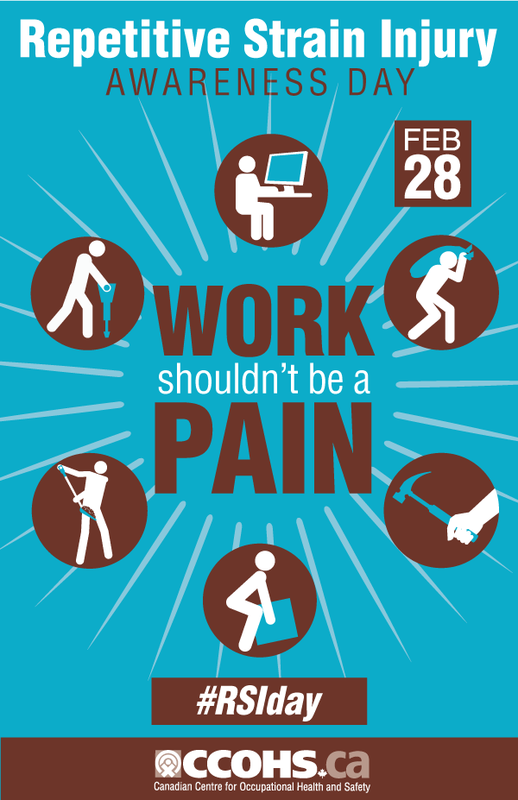 Other contributing work factors may include awkward postures and fixed body positions, excessive force concentrated on small parts of the body such as the hand or wrist, a fast pace of work with insufficient breaks or recovery time, and psychosocial factors such as stress. Hazards are best eliminated at the source. Prevention of RSIs should focus on eliminating repetitive work through job design which may involve mechanizing certain tasks. In addition, jobs should be structured so that workers can rotate between different tasks, using different muscles groups. When it is not practical to eliminate the repetitive aspect of a job, a well-designed workstation that is adjusted to fit the worker and allows standing, sitting, or sitting-standing positions, can help. Workers should be provided with appropriate, carefully maintained tools and equipment to reduce the force needed to complete tasks and prevent muscle strain, and avoid awkward positions. 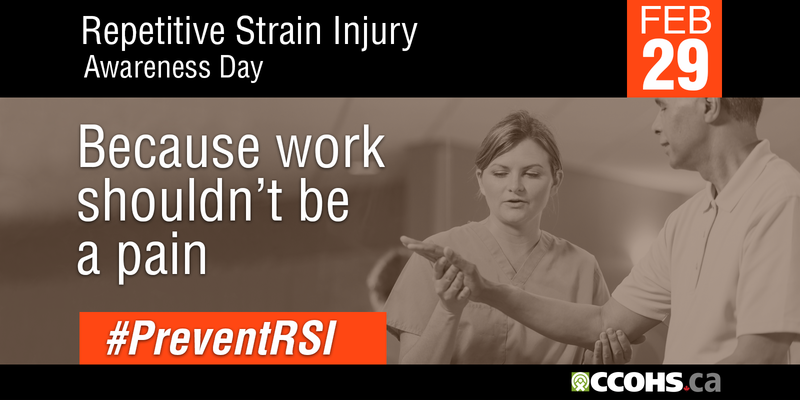 Because RSIs develop slowly, workers should be trained to understand what causes these injuries, how best to prevent them, and how to recognize the early signs and symptoms of RSI. Workers need to know how to adjust workstations to fit their tasks and individual needs. In addition, employers should encourage workers to take short, frequent rest breaks. Because work shouldn’t be a pain. And hands. Prevent the pain. 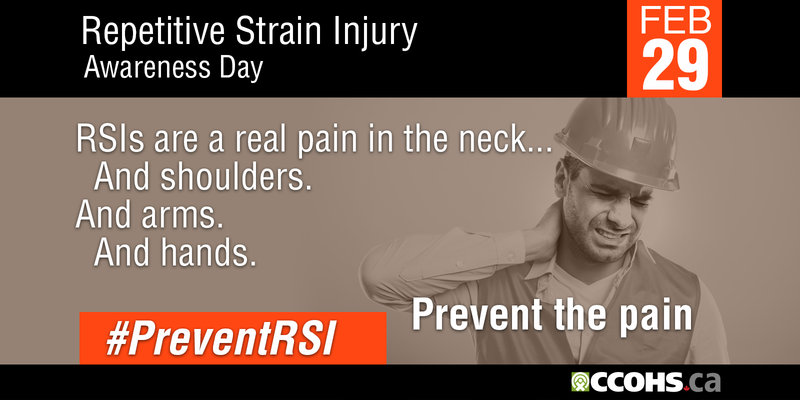 Provide workers with information about repetitive strain injuries. Download these badges and link to this RSI Day page. For more information on workplace hazards, search our OSH Answers Fact Sheets, or contact our Safety InfoLine.